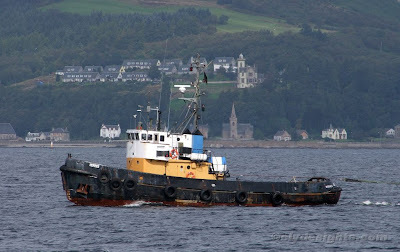 This old tug, HERMES, was built in 1957 for the Swedish Navy and had been lying for a number of days in the James Watt Dock. Towing a barge that appeared to have been fresh out of the Garvel Drydock, HERMES has recently been working on the construction of a new ferry terminal on the island of Raasay. Now owned by Atlas Marine Contractors (reportedly reformed as Atlas Subsea), HERMES is of 185 gross tons, is 24.5 metres in length, and has a bollard pull of about 10 tonnes. Her icebreaking bow - essential in the cold waters of the Baltic - is just visible. I had heard that the company had gone bust? Indeed, Douglas, hence my remark above: "reportedly reformed..."